good recap. 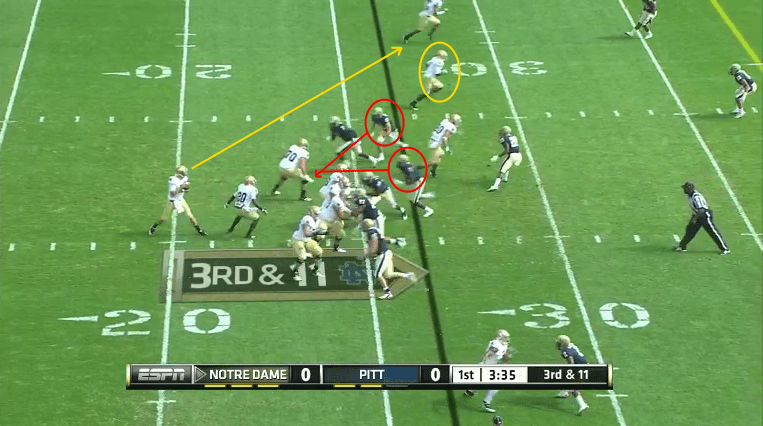 as i alluded to during the game (on twitter) as well, it’s clear that pitt’s “straight up” pass defense was woefully poor and their best bet was to confuse coverage/blitzes & bait a young/inexperienced QB into making incorrect audibles & reads. with the combination of turnovers/quick changes and poor punting (which gave the defense a short field), it prevents the opposition from sustaining a drive to score and/or change field position…which would have given offensive staff time to discuss & implement some quick changes. 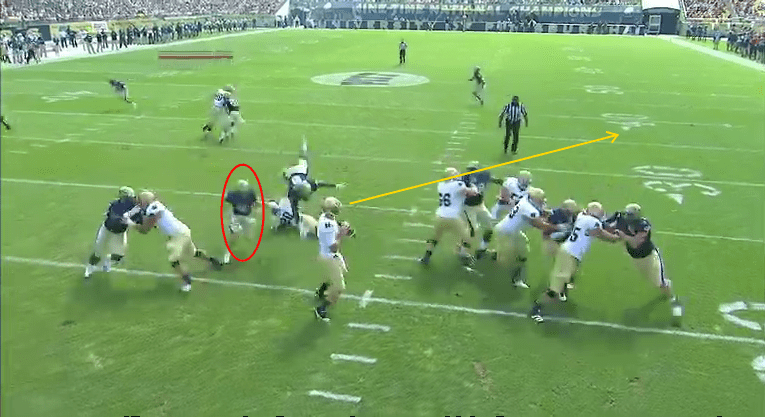 we saw this situation for the majority of the sc game last year, with linemen dropping into slant routes and knocking down passes at the line of scrimmage. like you, i hope rees starts looking off safeties soon. as well as our defense played, i also give credit to pitt’s defensive coaches for a good gameplan to confuse our QB, take away our primary receiving weapon, and shorten the game to maximize their chance of victory. it nearly worked. I think Kelly may need to consider taking the audible privilege away from Rees. It’s important that he gets a chance to do it, but if he is so far off in reading things that Kelly can see clear as day, Kelly should be the one to change plays. Only other thing to do is really just keep up the film work and practice. As frustrated as we are, it’s hard to remember that Rees is a true sophomore that has less than season under his belt. The mistakes he is making are classic young QB mistakes. i personally think Rees rolling out is dangerous. i don’t think he’s done well in those types of plays or when he’s been forced to rollout. I agree with not rolling Rees out. 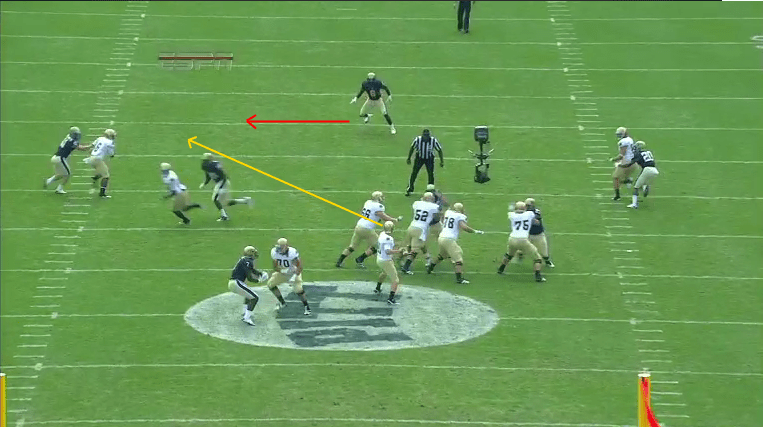 A) He tends to float….drift….toward the sideline. On a roll out there should be a point where he stops, plants and throws, or heads toward the LOS and throws decisively on the run. not sure if Kelly will take away the ability to call audibles from Rees. I think Kelly values the QB vantage point – and Rees has proven his ability to check into run plays based on coverage – so he’s got that going for him. I’m intrigued with Kuk’s suggestion we go run only a bit, to get a groove going before letting Tommy loose. I too have asked the question as to why we haven’t been able to run the offense as fast as I was led to believe a Brian Kelly operates at. oh and Ryan, great recap. Going run heavy like that has happened before: USC. I doubt Kelly will ever take the audible ability away from Rees, but I’d prefer that over another QB switch that isn’t needed. If you’re going to go ahead and break down film then break down the final drive of the first half and the last drive where Tommy went 8 for 8 and threw the go ahead TD. Why would I do that when the objective of the post was to explain how the turnovers happened and what I meant by Rees locking in his primary option? 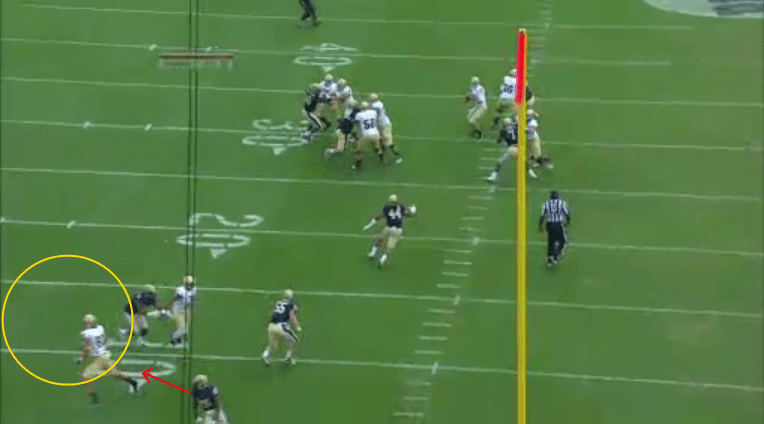 My analysis of the TD drive would border on nitpicking. I’m not trying to create a QB controversy or blast Rees. The post is meant to highlight the best examples of Rees playing “sub-par” as Kelly would call it. They are classic mistakes a young QB makes and they are all correctable. I’m glad you broke down what you did as it was informative. But if you’re going to take the time and break down bad plays, break down some good ones so the reader can see what a good play looks like from Rees’ prospective. I encourage you to start your own website and do just that T-Bone. Just my prospective…. well presented summary, Tex. And for those griping about “negative” focus, pay attention. This is what’s holding the team back… QB decisions this year are HORRIBLE… one good drive doesn’t offset that. Crist should turn in his uniform, finish his classes and get out of Dodge, because he is never going to see action again because the coach never makes a mistake (or admits to one ala Tulsa last year). This is nicely done. I will make two points, however. 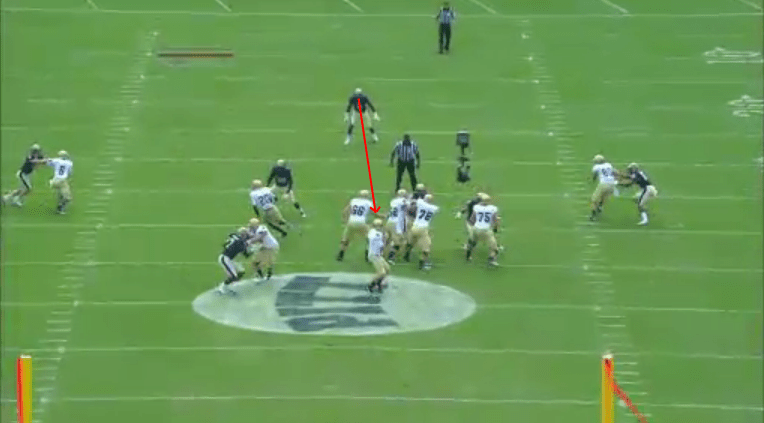 On the sack fumble play, Rees’s reads are undoubtedly long to short. My guess is that he didn’t fail to see Riddick, but he was looking for a throw past the sticks. In hindsight it would have been better to throw the checkdown to Riddick, but he probably would have been tackled short of the sticks and we’d have punted on 4th and 3. 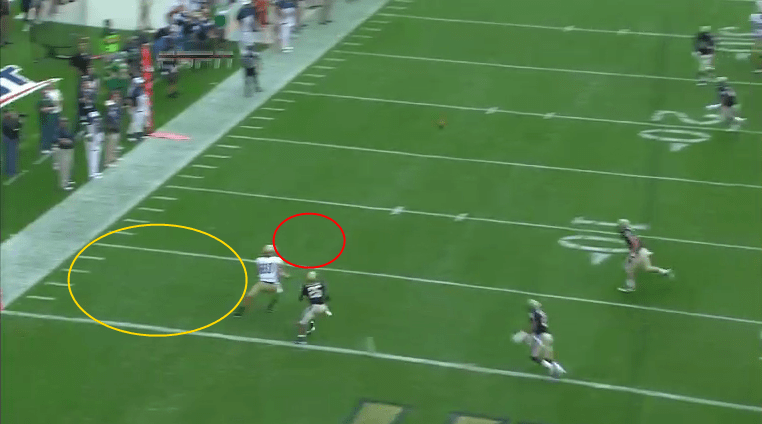 In the interception throw, it looked to me like Eifert sat down in what he thought was a hole. If Rees had been a little earlier, that would have helped, but Eifert probably was worried about running out of real estate. In both cases, Tommy could have made better decisions (and will eventually) but there are (as you point out) multiple factors at work. Not being a know it all, but since I played the position…you that you do not typically have a progression read on a blitz. It’s your hot receiver, and that’s it. 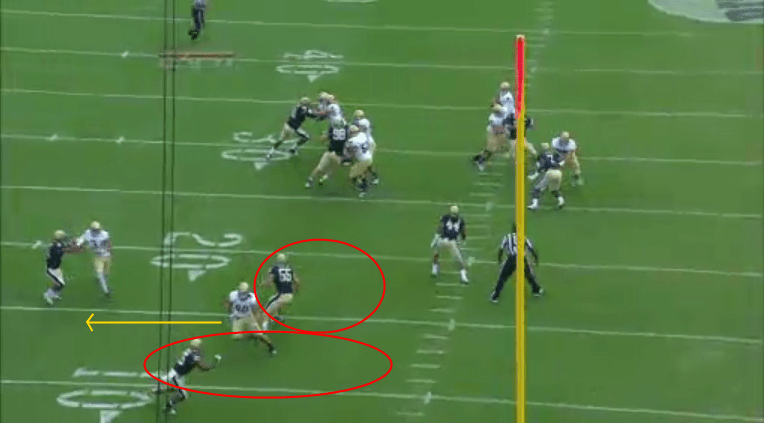 The defense shows its soft belly in one spot if they bring six rushers and you need to recognize and release, NOW! You would typically take your chances in the flat that your receiver can elude one man and get to the marker for a first…if not just bust it long. As for the pass to Eifert, I think you are both right, Rees should have both read and thrown that route earlier, and more toward the sideline. Agreed on the hot route point. You can’t wait for anything to develop. 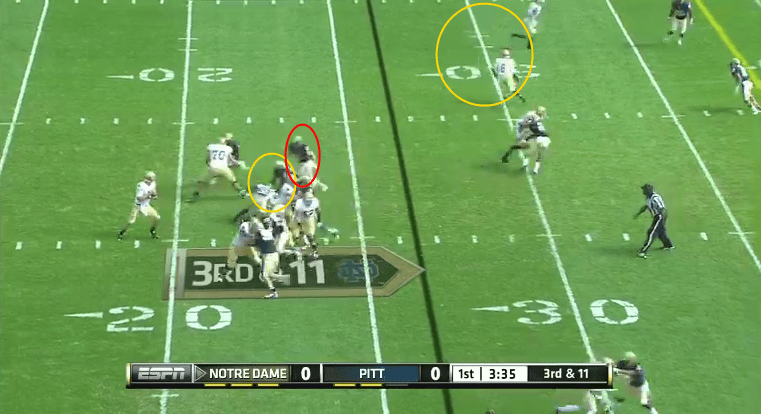 Better to throw the short pass and let Riddick attempt to make a play for the first. A punt is always better than a fumble. I wouldn’t say “always” given our punting this year, but certainly the vast majority of the time. The way things have gone this year, it probably would have been returned for a touchdown and we would’ve given up 7 instead of 3. I guess I could have been more clear. (I played a little bit too at that position eons ago, and I was terrible.) I think he might well have not seen where all the blitzers were coming from or (with too much moxie) thought that Wood would pick up the blitz and buy him enough time. It’s hard to say for sure, but it’s a clever blitz because the DB who gets him is actually mostly screened from Rees’s view when Rees is looking that way. (I know in theory that Rees could have deduced this from Riddick being open but at the point he’s looking that way, I’m not sure how well he can see Riddick over Wood and both the defenders.) He really only becomes visible to Rees as he starts to turn to his right. So he might well have seen just one blue shirt, figured Wood had him and that he had time to look the other way and see if he had Floyd beyond the sticks. I agree that if he knew that Pitt had them outnumbered on that side that progressions be damned, you’ve got to get the ball going in the direction of a white shirt with an eligible number that isn’t blanketed by a blue shirt (that being Riddick). Of course, as you know, this is all crystal clear with freeze frames as opposed to about 1 second to make up your mind. My general point about the reads and the down and distance is that when you are forced into those plays where your first reads are downfield (and the defense knows this) bad stuff is more likely to happen. On the interception play, it’s not clear from the frames but I rewatched it and I think part of the problem is that Rees actually bumps into an OL and delays him getting the ball out. I’m not trying to excuse Rees. He played badly in the 1st half of the game. 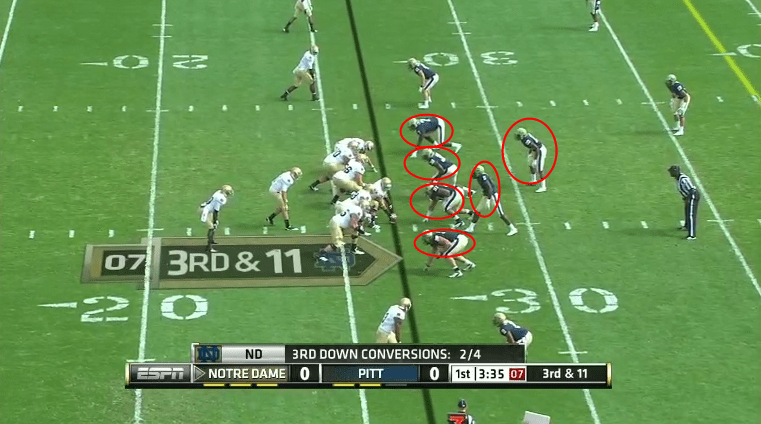 There were about 3 other plays that could have been interceptions, including a possible pick 6 on the 1st or 2nd series. Rees needs to play better, but so do some other guys. I disagree with taking the audibling privileges from Rees. 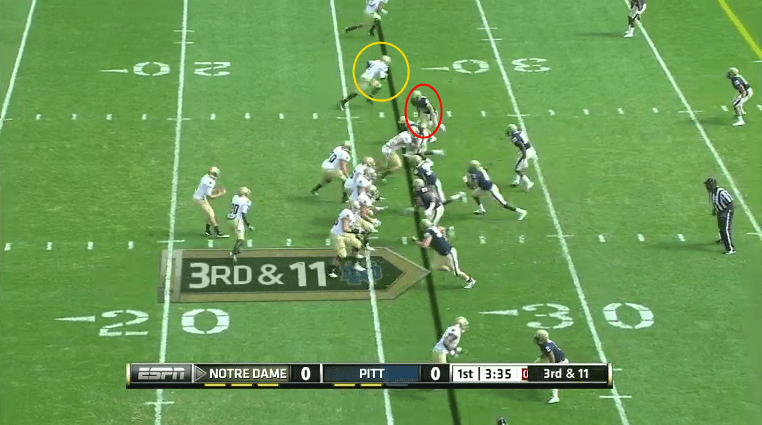 Maybe simplify them a bit, but he has to be able to check out of a play when he sees blitz. Also, he seemed to do a great job of changing plays in the Michigan game, at least through the first 3 quarters. I love the analysis, wish I saw all of these things during the game. I would say although the interception was a bad throw, he did seem to get hit. So I don’t know if he meant to throw outside and his getting hit hurt him, or if he just doesn’t have the arm strength to make that throw. Either way, again, great analysis! What’s interesting to me about the first play is that it indicates a lot of confidence on Kelly’s part in Rees’ ability to convert the 3rd down. No draw play, screen, or short crossing route to try to make it a manageable 4th down/long field goal, but instead four vertical routes to stretch the coverage and get somebody open past the sticks. 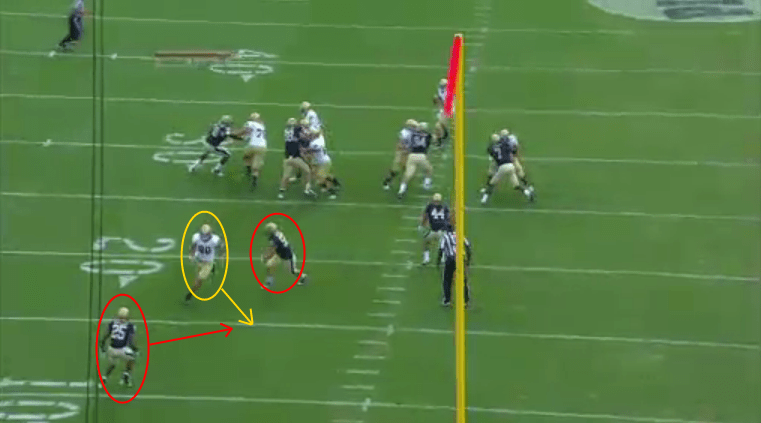 Also, after re-watching the play online, I’m not so sure Eifert is as open as those still shots make it look. 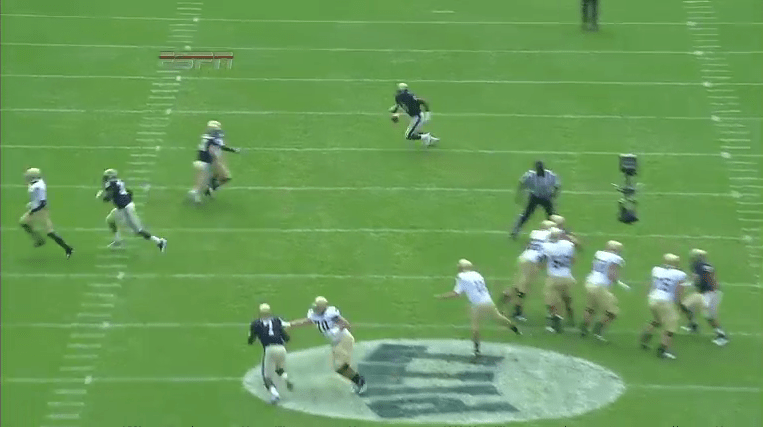 From what I could tell, Pitt was playing Cover 3 man, so there should be another DB somewhere just off camera to the right. Of course, he may not have been in position to make a play if he was more occupied with keeping over top of Floyd on the far right. Either way, I won’t disagree that it’s a better choice than throwing to Riddick there.